This tool allows you to create modpacks/groups of mods which you are then able to select and play with. Right now, you still have to gather all the files manually into a specific folder, but after that, this tool will take care of everything else. To run this, you'll need Java 8. Please uncheck the Ask toolbar box when you install Java. After that, you can just start it by opening the .jar file. When you first open the tool, you might be asked to enter the data directory and the executable file. This happens if my automatic system can't find your stuff. After that, it will move your mods folder to <factoriodata>/fmm/default/. This will be your first mod pack. To create new mod packs, click the "Open data folder" button to open a file manager window of the factorio data folder. Then create a new directory. The name of the directory will be the name of the modpack in the GUI. Put all the mod files into the new directory. To see new modpacks or changes to existing modpacks in the GUI, you have to relaunch the tool. It will have the capability to do this automatically soon. 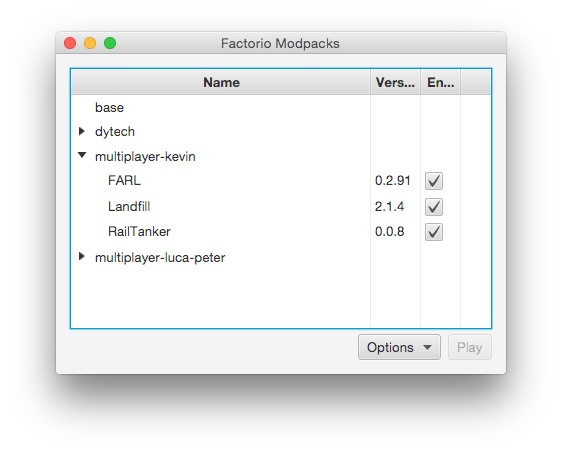 To launch factorio with a modpack, select one in the list and click play. It will now copy all the files from the modpack's directory to the mods folder and then launch the game. Last edited by narrowtux on Fri Sep 11, 2015 4:40 pm, edited 2 times in total. especially the way you handle modpacks ! maybe if you want us to work together for a more complete one ? just ask me ! Hey thanks for the kind words. Do you already have something to show? Code perhaps? The next steps I would like to do are to allow the player to choose a savegame he/she wants to play and the manager would figure out what mods are needed to play the save. I will happily accept pull requests if you want to implement features yourself. I released 0.2.0, which includes some fixes and automatic scanning of the fmm directory even after the app has been launched. That means that changes to the directory will be reflected in the app and you can edit your modpacks while the app is running while not having to restart the app after that. Please note that updates are not instant, at least on my operating system (take up to 5 seconds). narrowtux wrote: Hey thanks for the kind words. Do you already have something to show? Code perhaps? as to your idea, that's a great one ! There is one to start a certain savegame in multiplayer mode, which is good enough. Might be able to do this with a mod as well to start in real singleplayer. my resolution i use is a shell script. i have one folder with all my mods (MODREPOSITORYPATH) and a list of mods (modpack1). - when i update a mod, i download it in my modrepository. than i start the srcipt. and implement different methods how to give the user a choice to download new mods. here the short code snippet for InlineAttachments. I use jsoup.org, scan the webpage and collect all donwload links in the first post and make a list of possible downloads. downsides: i analyze webpages with all the negatives effects off changing the html structure also a user must decide, what is the newest mod. I intentionally didn't want to include automatic updates because that's super messy when there's no central repository. I can however make it easier to update mods. As I want to read mods from savegames soon to collect all the mods needed to play a save and then launch factorio with those mods, this needs to happen anyway. The only problem I have is that I kinda like having it like this, you manage stuff with your file manager and it automatically scans everything. Zero-config. Also, you may want to run older mods in some weird case. This all will make it super hard to make a nice GUI for it. I don't want a bazillion of buttons. narrowtux wrote: I intentionally didn't want to include automatic updates because that's super messy when there's no central repository. I will have my new computer tomorrow if everything go according to plan and will then be able to go deep into my code ! We could make a central repository where devs can register their stuff and also updates. Then I would happily integrate this into my app. Hmm, people still use my launcher? Interesting. And dont forget about the linux users! OBAMA MCLAMA wrote: Hmm, people still use my launcher? Interesting. Do you know if the site exists now? Otherwise I'd talk to the guy to maybe help launch it or something. Before that, I'd not implement anything that potentially gets messy. My next step would be to implement scanning savegames, selecting the mods that are needed to play and then launch factorio with those mods. I think this would save some users a lot of time. Linux should work, they just have to set the directories themselves because there's no standard paths for either data or executable. hey, maybe we should all meet up on skype or something to talk about what we need exactly for such a server and then set it up all together ? StanFear wrote: hey, maybe we should all meet up on skype or something to talk about what we need exactly for such a server and then set it up all together ? Yeah we can do that. I'll PM you my details. It doesn't seem to detect mods that are just in folders. It only detects those that are in a zip file. sadris wrote: It doesn't seem to detect mods that are just in folders. It only detects those that are in a zip file. Correct. The next version will have this. well, it would be possible if factoriomods.com had some kind of API to use ... for now, there is none ! Last edited by Talguy on Mon Aug 03, 2015 10:12 am, edited 2 times in total.